We've been quite busy at this year's ongoing BFI London Film Festival lately, and we've caught plenty of conventional and unconventional new releases. One curious thing we've noticed this year however is the use of a "crowd-pleaser" as some sort of derisory term. Well, by definition, it's kind of a good thing non? Anyway, the new one from IDER is what we'd call a crowd-pleaser. In the best way. Listen to the rousing 'Mirror' below. 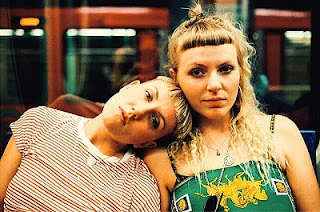 This is the first proper mention we've given IDER, but we'd like to consider ourselves as OG supporters in some respect, having chosen the duo as our Glastonbury Emerging Talent Competition picks back in 2014 back when they were simply Lily & Meg. They've continued their good work but 'Mirror' feels like a step above what's come before. Working with London Grammar producers MyRiot, 'Mirror' has the same anthemic flow that sparkled in Haim's 'Want You Back' last year as well as some lyrical/thematic reminiscence to TLC's 'Unpretty' and 'Ugly' by Sugababes. So resonant, so real - so good. Find more info at facebook.com/weareider.